First-time private equity funds secured $26bn in capital commitments across 226 funds in 2017. This follows historical trends: although the number of first-time funds closed was lower than in 2016, it was in line with industry-wide trends. However, the private equity industry is seeing an unprecedented period of fundraising, and so first-time fundraising is representing a falling proportion of overall activity: first-time funds accounted for a quarter of vehicles closed through 2017, but they secured just 6% of total capital raised – a 10-year low. Additionally, though private equity investors have seen more liquidity arising from record distributions in recent years, the overall proportion which will invest in first-time funds has stayed level since 2012, and most gains have been reallocated to established fund managers. First-time fund managers secured $26bn in capital commitments across 226 funds in 2017. This is adecrease from the 283 first-time funds which closed in 2016, securing $36bn. 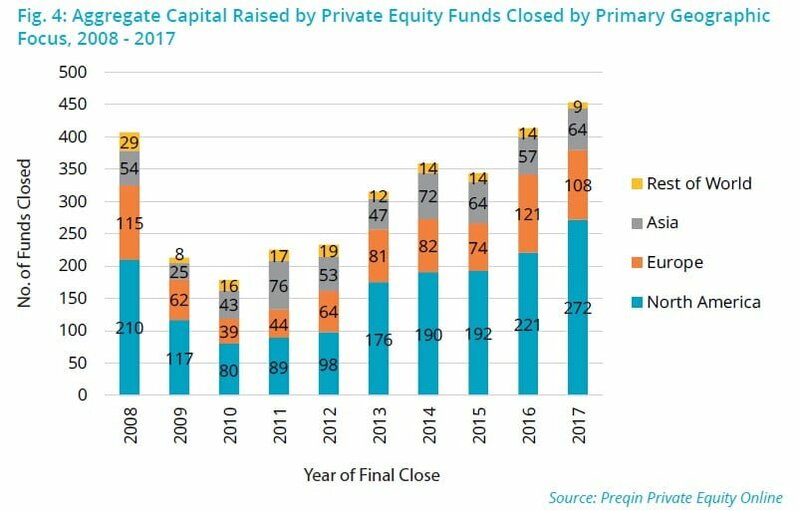 First-time funds account for 25% of private equity funds closed in 2017, up from 23% in 2016. However, theyrepresent just 6% of total capital raised through the year, a decrease from 9% in 2016. The average size of first-time funds has grown by 36% since 2010. However, this has not kept pace withestablished funds, which have grown by 230%. 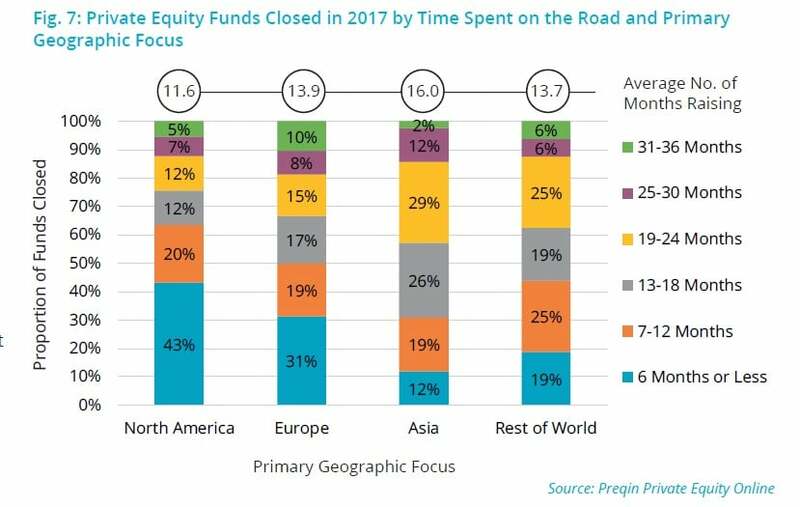 The average time first-time funds spend on the road has dropped slightly in recent years, from 20 monthsin 2010 to 17 months in 2017. By contrast, the average time spent in market by established funds has decreasedfrom 19 months to 13 months in the same period. Seventy-three percent of first-time funds closed in 2017 met or exceeded their fundraising targets, up from47% which did the same in 2010. However, among established funds the trend is more pronounced: while 59%met or exceeded their target in 2010, 82% did the same in 2017. Emerging funds typically deliver better returns to investors than established funds. First-time funds have postedhigher median net IRRs across 10 of the 15 vintage years since 2000. As of the end of 2017 almost half of investors (49%) will consider investing in first-time funds, on par withfive years prior. However, the proportion that will not invest has risen from 37% to 41% in the same period. 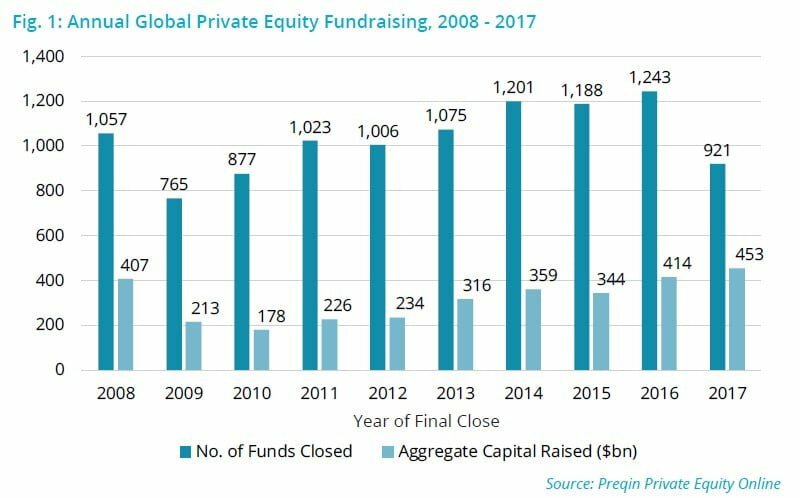 “Private equity had a record fundraising year in 2017, with aggregate capital raised exceeding $450bn. While it may seem that this rising private equity tide has not lifted all boats, first-time funds are still seeing significant activity: over 200 funds raised $26bn, a decline from 2016 but in line with historical trends. Furthermore, first-time funds are raising capital more quickly on average, and greater proportions are meeting or exceeding their fundraising targets than ever before.